Firstly – Congratulations on your upcoming wedding! At Mystia, we know that your wedding day is one of the most special days of your life, and you want to look and feel amazing. 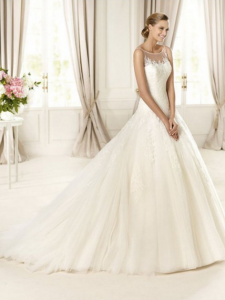 We also know that the process of choosing your Bridal Gown is an important part of this special occasion, and so we want to give you the best experience possible. Our staff really care about helping you find the right dress, and are sure you will find it in our relaxed and stylish Boutique. You will enjoy a 1.5 hour private appointment with the one to one attention you deserve. The gowns in our collection have been carefully chosen from top designers all over the world, to bring together a range of styles, shapes, fabrics, and colour options. There is something to compliment every size, shape and personal style. You can find out more about our Designers by browsing the buttons on the right. If you fall in love with a particular style, let us know when you book your Appointment as most of the Designers offer a sample loan scheme if we don’t have the style in our permanent collection. If you order your Bridal Gown on your 1st Appointment with Mystia, we will give you 10% of the cost of the dress to spend on Bridal Accessories! You can also purchase your Bridal shoes for half price when ordered at the same time as your Bridal Gown. Our Bridal Gowns are priced between £699 and £1,499 but most of the Bridesmaid and Prom styles are available in white and/or ivory for Brides on a smaller budget. The Tiffanys collecton offer a variety of lovely styles, available with or without trains from just £299. Please let us know, when booking your appointment, if your budget is under £699 to ensure that we have suitable collections available for you. Being a Mystia Bride also entitles you to 10% off a Mother of the Wedding outfit and a very special discount on Bridesmaid dresses. Top Trends for 2013 – Lace is still very popular with Brides, although the trend is moving away from fishtail towards sheath and a-line shapes. Straps are definately worth considering. Beautiful organza princess gowns are really coming into their own, with Designers creating crystal encrusted bodices, full skirts, and unique structural styling. Soft colours are in fashion, such as blush, light gold, champagne and even silver. The effect of a coloured material under lace can be very striking. Create Your Own is very popular – Brides choose an un-embellished gown and choose their own detailing, such as a belt, straps, crystal trims, etc to make a unique statement.